Since a couple of people have asked about how I put together the Learner Activity Hubs for OpenEdMOOC and YogaMOOC, I thought I would put some of the specifics into a blog post for reference (and to help myself remember later how I did it if we ever do another one). Many of the basics are covered in Alan Levine’s most excellent guide to setting up a network hub, so I will only really cover the few things that I did in addition to those instructions. I also won’t cover too much on where to find options in in WordPress – hopefully you can find that easily online, or already know how to do things like add categories, edit posts, upload images, etc. No wall of text. It is pretty easy to dump all course blog posts in one place and have a never ending scroll of text. But that is hard on the eyes and a little counter productive to getting people to connect. Also a bit dehumanizing to the individual posts. Link back to individual websites. The wall of text also discourages people from going to individual blogs, and seeing them as unique individuals. So I wanted to have a theme that at most displayed the post titles, linking back to the source website. Images or graphics to humanize each link. If at possible, I wanted pictures of people to link back to their blogs. This introduced a few unique challenges with technical limitations, but I will discuss work-arounds below. The basic flow of the work would be that participants that want their work to go into the Hub (this is voluntary) would fill out a form to get me the details about their blog. I would get the results of that form. 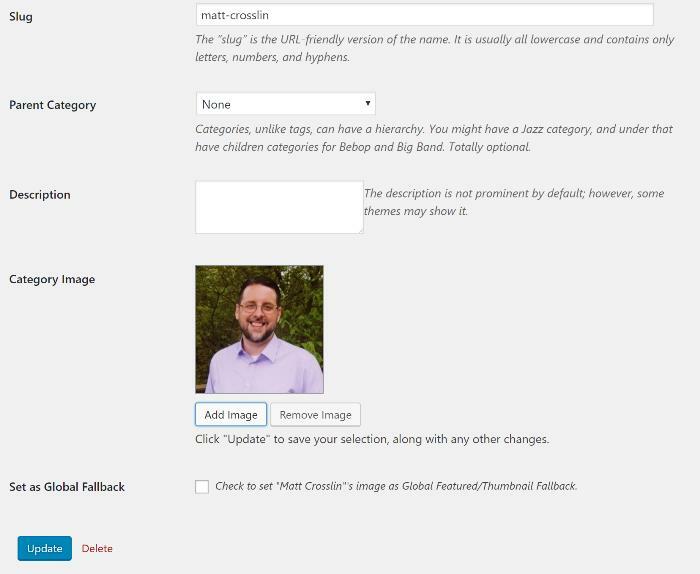 I would then create a Category for each person (based on the name or a pseudonym they give me), attach a featured image to that category (one that they choose), connect that category to an RSS feed from their blog, and let the magic happen. That way, when they create a post, an image of them with a link to their blog post is added to an image grid of blog posts. I love the results, but the process to get there is a little more involved than I thought it would be. FeedWordPress plugin. This is a must have for the Hub – see Alan’s instructions above. Morphology Lite Theme. This one had a nice image-based front page blog grid, although you can’t read the titles until you mouse over each image individually. That part is a bit annoying – I would like to find one that has the image with the text imposed over it. But this theme does the basics of what I need it to do well. Ajax Search Lite plugin – as the YogaMOOC Learner hub grew, it became hard to find certain people’s work. This plugin seems to work well as an intuitive search. See the results here. However, I couldn’t get it to work on OpenEdMOOC, which had more plugins than YogaMOOC. It may not play well with some plugins. The first step was to install Morphology Lite and set up my installation like their demo was set-up – they have some handy instructions here. 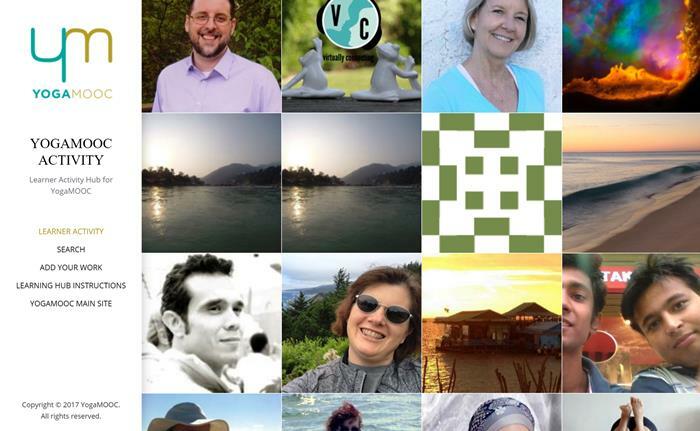 For YogaMOOC, the blog hub is the front page. 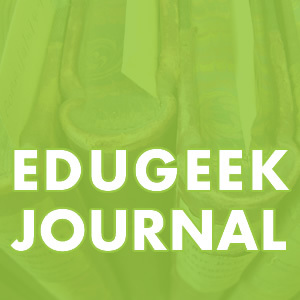 For OpenEdMOOC, the blog hub is not the front page. It can be set up either way. One thing to note: there is a setting to tell how many images are on the front page (found in Appearance > Customize > Blog Options > “Image Post Template Count”), and it is initially set pretty low. If you are expecting a lot of posts, you might want to set it high (I currently have YogaMOOC set to 600 with no problems). Next is to set up the FeedWordPress plugin. I pretty much follow Alan’s instructions above except for one change: I don’t set a default category for all syndicated posts. I do that for each participant individually so they get their own unique category (and make sure all incoming categories are converted to tags as Alan’s instructions say). The reason for this will become apparent below. Also, you can choose to set up the syndication update scheduling how you like. Because the OpenEdMOOC Hub is smaller, I have it set up like Alan recommends. Because the YogaMOOC is so large, there are typically a few problems with updating automatically. I have to update that one manually each day to deal with those issues. The Category Featured Images Extended plugin pretty much works right out of the box, but I do recommend setting up a Global Fallback Image, which I will go into below. The Ajax Search Plugin can be configured how you like, but I recommend making sure to turn on any option that says to search Categories as well. To get the data from the participants, I created a Google Form and embedded it in a page with some basic instructions and a link to more detailed instructions for those that need it. I just collected the information that I needed – but getting user images is a bit more difficult. Depending on our course, you may want to set up a different system for collecting user images. 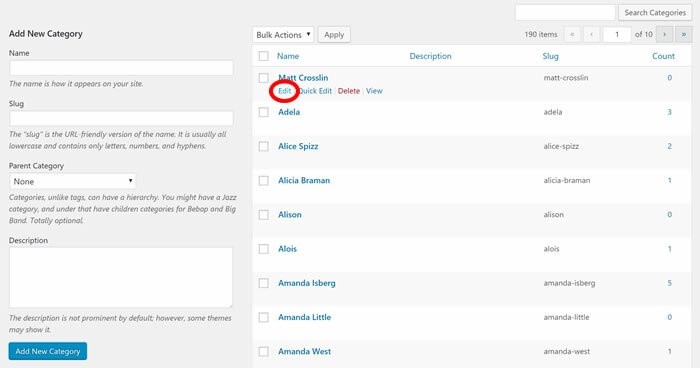 The final part of the set-up was to create an initial post that contained the instructions for adding blogs to the hub. I kind of see this post as the cut-off point for older posts – anything older then this was probably not created for the course and can be removed from the Hub. This is up to you of course – you can keep older posts if you like. But this initial post also serves as a visual placeholder to make sure your blog display limit is high enough – if you don’t see the post at the end, then turn up the limit. I also use this post to create the global fall back image for the hub. I set up a default category for the blog, and then add an image branded for the course. The key is to check the “set as global image” option. when editing the Category to add the default image. This will set your course iamge as the default image for anything that doesn’t have one. This can help you to see any feeds that you set up incorrectly: if you see the image where it shouldn’t be, this signals you that something is wrong with that feed because it is falling back to the default. This is where the time consuming part happens. It only takes a minute or two to set up each person, but once you get a long list of people it can add up. However, this is a time commitment that decreases over time once most people in the course that are going to sign up for the hub are signed up. Since I used a Google form to collect information, I can get the results in a nice convenient spreadsheet. This is where the fun begins. Some people fill out the form great, others miss a lot. I try to extract a name, a link to a blog feed, and an image for each person. The name and image can be flexible, but if the blog link doesn’t work or has no RSS feed, I mark it as a problem and move to the next one. Additionally, I try to respect what people put in the form. If they say they are using a course tag instead of a full blog, but there is no tag, I mark it as a problem and move on. Once I get through the whole list, I send an email to those with problems with links to help them their issues (typically a form email with everyone BCC’d on it). The “add image” option can be found near the bottom of the edit category page. Something to think about for images in the Morphology Lite theme: the system displays the image at full size on the front page. This will lead to a chaotic patchwork effect for images of different sizes. If you like that, then no problem. I really wanted to have an organized grid, so I manually crop and resize each image to 240px by 240px. This takes time, but gives a good grid for the final product. A quick note on finding images. I tell people to have the image they want on their about page of the blog they use, but not everyone does that. Some of them I have to search the source code for an avatar that is hidden (WordPress loves to do this for some reason). Sometimes I have to pull one of the images off the header or sidebar of the blog. But since many of these are stock images within the popular themes, those run out quickly. So then I look for their Twitter avatar if they have one. But sometimes (more often than you would believe), I come up with no images – anywhere. So I basically run their name through jdenticon to get a unique image and move on. The Next step is to go to the Syndication area to add the blog to the Hub. This is where it can get tricky as well. Not all blogging services work the same. 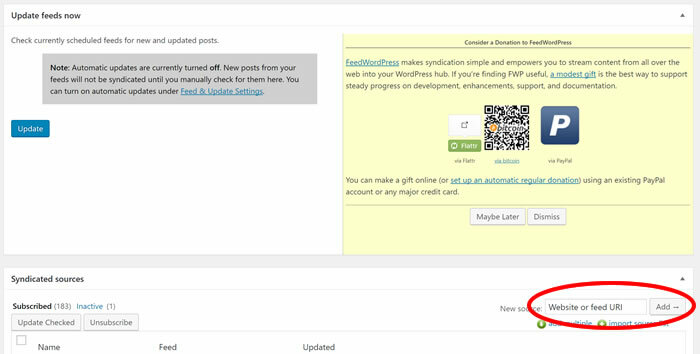 WordPress works the best for full blogs and tags/categories. Blogger will also work for full blog, but you have to do some link trickery to get Labels (their version of tags/categories) to work (see Alan’s instructions on this one). Some services like Wix, Weebly, etc are just downright problematic at best. They might need RSS feeds turned on for the whole blog, and often RSS feeds don’t work well at all for tags/categories. See Alan’s instructions again on finding tricky RSS feeds. If you are using Morphology Lite, there is still one step needed to add blog posts to the front page. Morphology only displays posts on the front page that are set to the post format of “Image.” FeedWordPress pulls in all posts as a “Standard” post format, even if you tell it to use the “Image” post format. That feature just doesn’t work in Morphology for some reason. However, it does give you the ability to moderate posts since you have to change each post to the correct format before it appears. Sounds weird, but you would be surprised how much non-course stuff I have gotten in the Hubs (resumes, recipes, and randomness, oh my!). That is about it – repeat until everyone is in. I will also send out a mass email to all that I added successfully as well as a mass email to those that had problems so that they will all know where they stand. 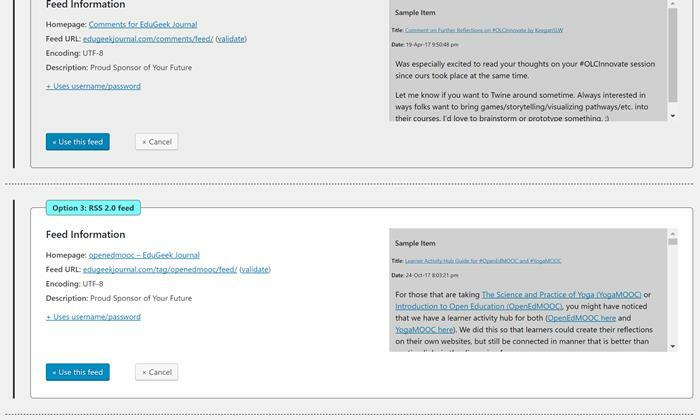 A quick note: if people update their post on their blog, FeedWordPress will also update the related info on your Hub. This will reset the post Format back to “Standard,” and the post will no longer appear on the front page. You might want to go through the full post list from time to time to catch these older updated posts. I tend to go through the moderation process each morning just to make sure it doesn’t pile up. Hope that covers it all – I will update if I run across anything I forgot. Brilliant work and documentation, Matt. After all this time, I am still a fan of using the hub approach, yet usually underestimate how much tending the machine needs. It’s more desirable, and what I do for projects I am brought on for, to have self registering forms, but it’s never free from having to regularly fix content. I do think it’s more sensible, even if it ends up a manual process as you do, to collect the blog info for a google form. I did this for one of the earliest outside DS106 course, Alec Couros’s ETMOOC. There was an interesting side benefit that only a glutton for punishment would enjoy- the one click check on the blog/feed URL meant I got a glimpse at the presence of all new enrollees. If was automated, I’d miss out. I think I checked well over 500 blogs (like I said, glutton punishment). That’s an interesting approach to associate the posts with icons of people. I typically try the various gymnastics to get featured images out of posts (from first images if its not WordPress). It never works 100% of the time. I too am not crazy on the mouseover needed to reveal titles. It reduces the ability to scan content I may want to read though to be honest, I prefer the feed reader approach for scanning the community, and I generate the opml feed and encourage people to use that as a means to quick scan/read for content. The people view does give a nice representation of the activity by person. But again, with the mouseover on titles, it’s not useful on mobiles. I do like on themes like Hamilton that I have been using, it’s a Customizer option to have titles displayed or only on mouseover. I do think the way to get the icons with the category setup does work, but seems like a convoluted process. If it was me, I’d probably find a way to get the author avatar in the user profile (wordpress feeds do good to get the author email, which means gravatar works). I’d probably child theme it, and change the front page loop to draw the featured image from the author avatar. Good to see some old school syndication hub activity going. How are your yoga moves? It was very revealing about the effort which has gone into making YogaMooc hub. You have explained it beautifully. The task is enormous and requires lot of patience of a yogi with the daily maintenance exercise. Thanks for sharing. Great exposure.